The family - three boys and three girls survived - lived in Groot Zundert, a town in the south of Holland. Not much is known about Vincent’s early life. His father, Theodorus van Gogh (1822-85), was the pastor of a small church (Dutch Reformed) which still stands in Zundert (pictured here as Vincent would have known his town). Like so many places in The Netherlands, Zundert has a windmill. Vincent left school when he was fifteen. The next year, following in the footsteps of his uncles Cornelis and Vincent, he became an apprentice at an art dealership called Goupil & Cie, which was headquartered in Paris. Relatively successful during his seven years at Goupil & Cie’s gallery in The Hague (in this 24 March 1873 letter van Gogh asks his brother to check on a painting by Schotel since he may have a buyer for it), Vincent transferred to the company’s London office in 1873. Two years of living in Britain was good for Vincent. He especially liked visiting the country’s museums and art galleries. British engravers, who produced illustrations for magazines like The Graphic, also made a good impression on the young van Gogh. By 1875, Vincent was working in Goupil’s Paris office. No longer interested in the paintings he was selling, he left the company and returned to Britain in the early spring of 1876. Van Gogh was twenty-three years old when he took a teaching position at a school in Ramsgate. Although his letters indicate that he enjoyed teaching, during the summer of 1876 he thought about becoming a pastor. He convinced his latest employer - Rev. Thomas Slade-Jones in Isleworth - to help him learn the role of a clergyman. Vincent’s sermons were uninspiring, however, and he returned to The Netherlands. 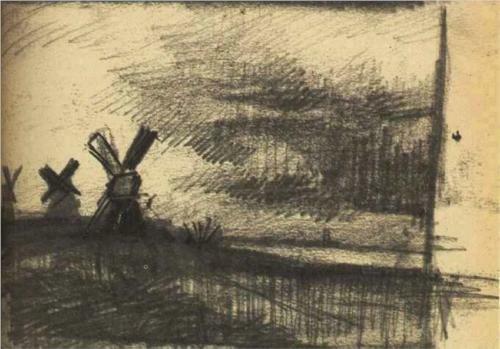 Initially, Vincent worked at a bookstore in Dordrecht, where his Uncle Cent had secured a position for him. While there, he frequently visited a museum and read religious books. Then he went to Amsterdam, to begin his theological studies. He wasn’t giving up on his goal of helping others, however. Obtaining permission from his church, Vincent moved to the coal-mining district of The Borinage in Belgium. His plan was to be a lay preacher to some of the poorest people in western Europe. Bos, Carole "EARLY LIFE" AwesomeStories.com. May 01, 2008. Apr 20, 2019.